Welcome to the 2018 Jewish Heritage Festival. We are very proud to be celebrating our 10th Anniversary Festival. The Festival started as the vision of the Temple Presidents’ Council for Volusia and Flagler Counties. A Steering Committee began meeting in January, 2007 leading to our first Festival in March, 2008 which was a rousing success that attracted 10,000 visitors. 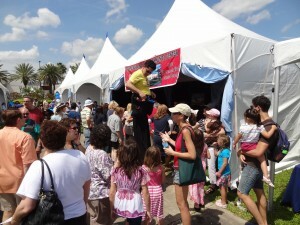 As one of our food vendors told the Daytona Beach News-Journal: “This is better than Bike Week”. The Festival is a 501(c)(3) non-profit corporation whose sole purpose is put this Festival on every other year. Festival funding has come from Sponsorships and tax deductible Family/Individual Donations. We are proud once again to have our Grand Sponsor back – the Endowment Fund of the Jewish Federation of Volusia and Flagler Counties as well as great local support from corporate and individual sponsorships. We continue to include a Health Fair at the Festival. We are excited by the response of our medical community as they share the Jewish Spirit of Tikun Olam – to repair the world. The Festival features continuous nationally acclaimed entertainment. Attendees can feast on Kosher, Israeli and Jewish-style food. We have Israeli and Judaica artists and vendors, Jewish Organization booths, and exhibits including a Holocaust Memorial and Jewish Hall of Fame. Our Hall of Fame is a multidimensional display that includes a Shtetl exhibit, an Israel exhibition, an Ancient Hebrew scroll exhibit and much much more! There are speakers in our Hall of Fame & Holocaust locales. Children’s entertainment is available throughout the day including a rock climbing wall, inflatables, face painting, balloon artist, a petting zoo and camel rides. You will even run into Moses and other biblical characters! 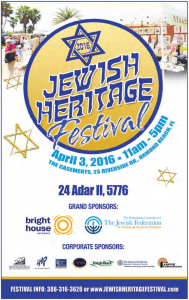 The Festival will express the heart and soul of Jewish Florida. For a single day it will intertwine the sounds, sights, and spirit of Jewish culture and bring together every facet of the Jewish Community, young and old, singles and families, regardless of their religious and cultural background. Like other cultural festivals, we also want to share our heritage with others – you don’t have to be Jewish to enjoy a Jewish Festival! Let’s celebrate Jewish Heritage. Please don’t miss an opportunity to be part of this special event. Lastly, I’d like to give a huge THANK YOU to the Festival Committee and the event day volunteers for all the hard work they did and will do to make the day a huge success. To stay updated on Festival news, please Click Here to “Like” our Facebook page. You can also Click Here to see pictures from the 2016 Festival, or Click Here to check out the News-Journal article from the last Festival.